The solar panel industry has been exploding in recent years. So much so, in fact, that the Solar Energy Industries Association® (SEIA) projected a 119% growth jump in 2016, making it one of the most rapidly growing markets in the nation. Not only are solar panel installations growing — with over 1 million individual installations nationwide at the beginning of 2016 — but they are also great in size, with the vast majority of panels residing in utility-scale installations. According to SEIA, solar energy sources comprise 64% of all of the nation’s new electricity capacity. The growth of solar power in the renewable energy sector has naturally led to job creation, with solar companies hiring at almost 12 times the rate of the national economic average. The influx of workers, in turn, enables greater production capabilities — more solar power was installed every three weeks in 2014 than in all of 2008. As this growth cycle keeps on turning, it continues propelling the industry forward. The metal frames that support solar panels can vary in strength depending on a vast range of shapes, sizes, wind load, and weight bearing requirements. Because of their structural diversity, panel frames are often custom made to meet unique customer specifications. Regardless of the level of intricacy or intended end use, however, they are most commonly made of aluminum and high alloy stainless steel. The metal frames for these installations require numerous solar panel components to ensure successful operation including racking components, brackets, reflector shapes, and troughs. At American Industrial Company (AIC), we can custom fabricate all of these parts through our in-line CNC precision punching and stamping services — holding tolerances within ±0.010 inch to help you achieve perfection for your part. To match each customer’s exact specifications, AIC also offers value-added secondary finishing services such as hot dip galvanization, plating, grinding, and heat treating. Our capabilities include servicing a broad range of materials including aluminum, copper, brass, stainless steel, and high strength low alloy steel, as well as pre-painted and vinyl clad alloys — enabling us to satisfy every customer’s unique solar panel and component needs. AIC is your one stop shop for solar panel projects, manufacturing individual frame components and complete assemblies alike, in both small and large production runs. Let us streamline your precision stamped part order by providing assistance from design and material selection to prototyping, manufacturing, and final finishing services. AIC’s metal stamped solar panel component capabilities include a broad range of materials. 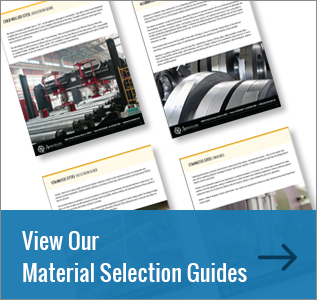 To learn tips about working with aluminum, cold rolled steel, stainless steel, and more, download our free material selection guides.